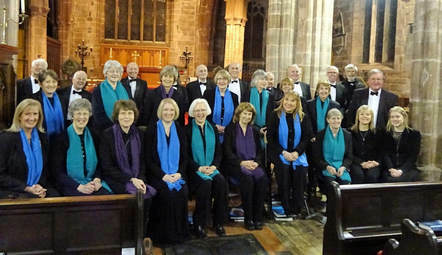 The Lydian Singers is a mixed voice chamber choir based at Knutsford but drawing membership from a wide surrounding area. The choir was founded in 1980 and performs a wide variety of music in a wide variety of venues. The Lydian Singers has developed a specialism in church music performed in liturgical settings and has sung in most of the cathedrals in the North and Midlands as well as in Segovia, Avila, Perugia, Spoleto, Orvieto and Assisi cathedrals. Previous engagements have included the semi-chorus in Elgar's "Dream of Gerontius" in Chester Cathedral, a joint performance with the Phoenix Singers of Bach’s "St Matthew Passion" in Shrewsbury Abbey and services at Blackburn, Chester, Durham, Liverpool, Peterborough and Salisbury cathedrals. In 2012, the Lydian Singers participated in services at Bangor and Lichfield Cathedrals, and returned to the Lymm Festival to give the second performance of a new work by Andrew Mildinhall, "Even Such Is Time". More recent cathedral visits include Liverpool, Tewkesbury and Brecon (2015), Lichfield and Worcester (2016), Durham and Peterborough (2017) and Southwell Minster and Lichfield Cathedral (2018). The Lydian Singers currently has vacancies for experienced sopranos, tenors and basses who are reasonably good sight-readers. For further information, please contact the choir's conductor John Naylor (see Contact Us).